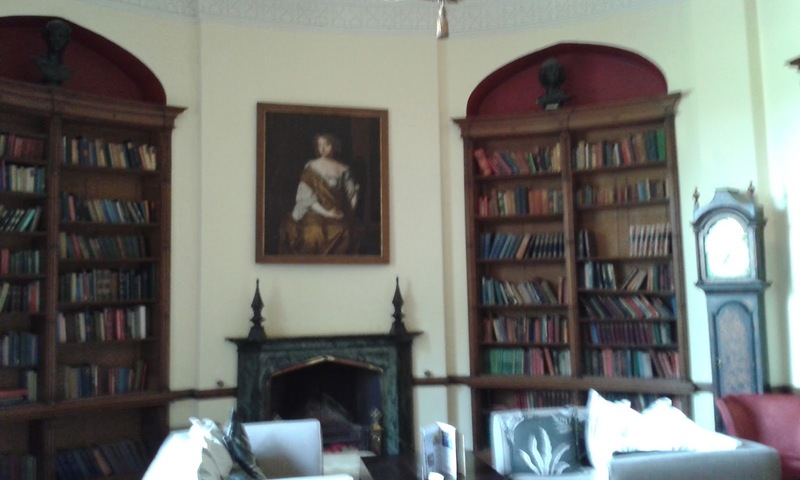 Somehow a house tour takes on an extra dimension when it’s a Grade I listed building and you’re staying there! 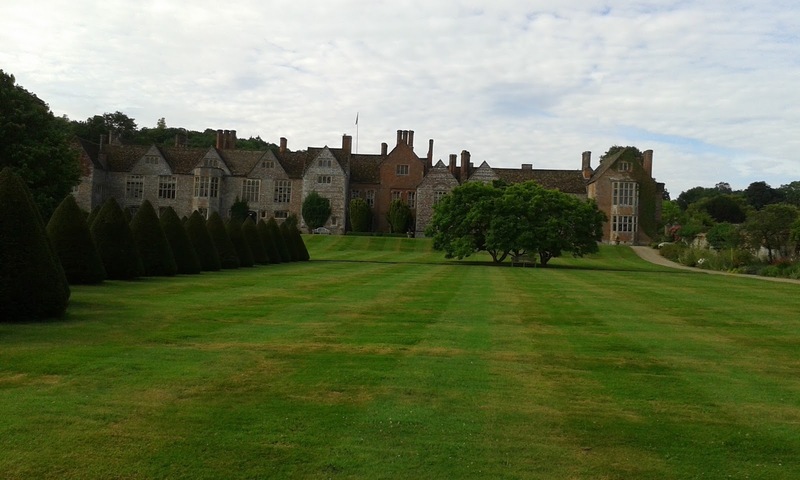 The Littlecote House of today began life around 1250 as a Medieval manor owned by the de Calstone family, though the Roman mosaic in the grounds and iron-age artefacts are proof of much earlier settlement. 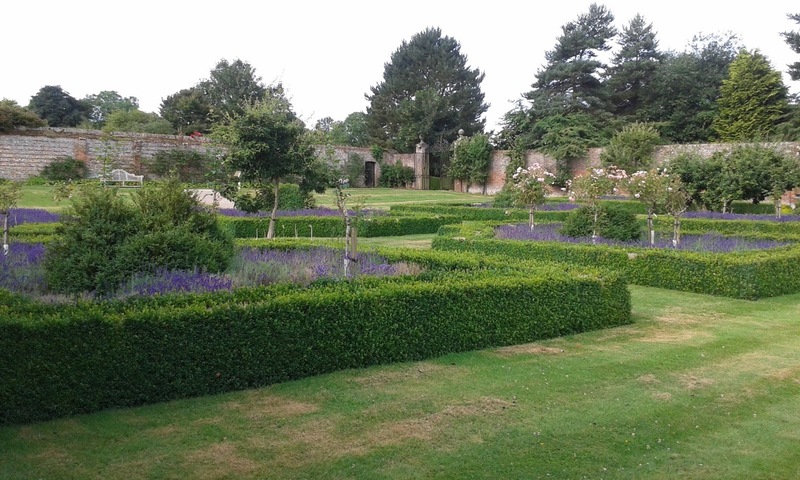 The Pophams acquired the house in 1589 and the Elizabethan manor was added. 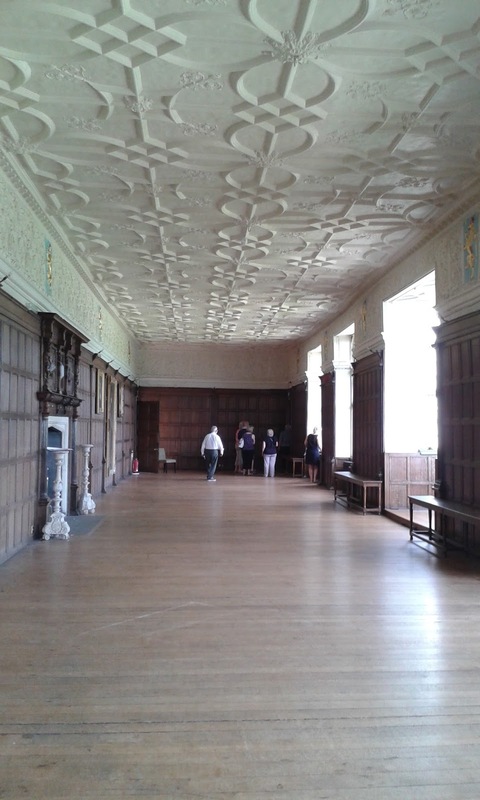 Our tour began in the Great Hall of the Tudor mansion which was constructed by Lord Chief Justice, Sir John Popham. 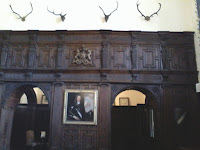 It was at Littlecote that Henry VIII courted Jane Seymour, though the Hall had not yet been built. 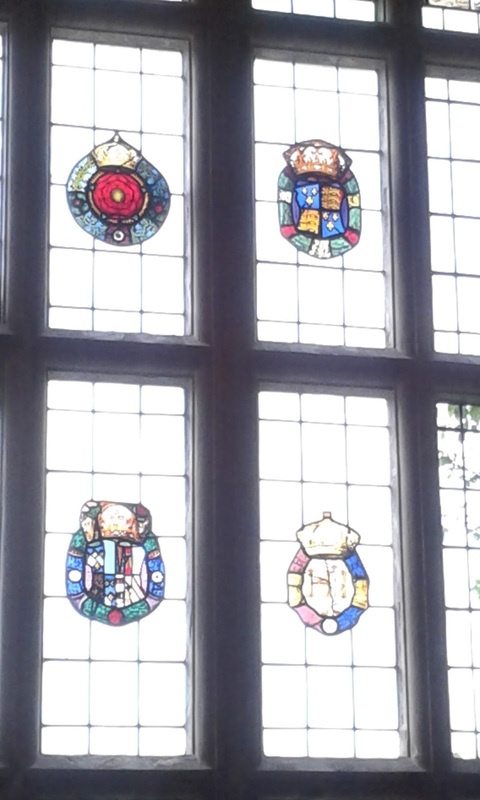 Sir John commemorated their courtship in one of the stained glass windows in the hall, setting it with four roundels, the Tudor Rose; Henry VIII’s coat of arms; Jane Seymour’s coat of arms and a love knot for Henry and Jane, though Jane's initial appears as a Latin I. A long banqueting table, referred to as a board, lines one wall. It was on this that the popular game of shove ha’penny was played. The game was overseen by a ‘chairman’, thus the term Chairman of the Board! Some armoury still graces the walls though much was purchased in the 1990s and is now displayed in Royal Armouries Museum, Leeds. Chinese Room - and what a view! 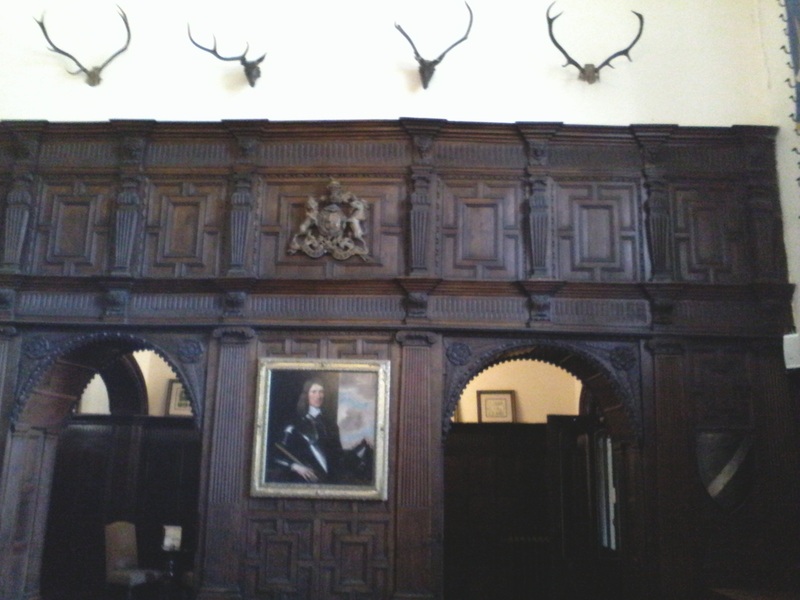 From the Great Hall we moved to the Chinese Room, named because the incumbent in 1810 considered the oak of the Tudor house too dark and transformed the room into Regency style. The panels are papered with handpainted Chinese wallpaper - there is a faint pencil drawing of a bird where the artist failed to paint it in - and valued today at £55k each. The wooden chandelier, valued at £35k, has been known to move when addressed: Good morning, Elizabeth. Yes, of course the house has a ghost. In fact there are said to be three. 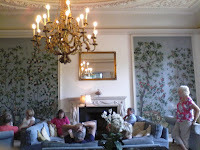 At the time this room was refurbished a wall was knocked through to create an Orangery. In the 1920s it was converted into the first ever indoor heated swimming pool to be installed in a private house. The pool, which is listed and cannot be demolished, is today boarded over. A new pool was added in the Stables Leisure Block when Warner Leisure built the hotel. Mahogany doors lead from the Chinese Room to the Library. Many of Judge Popham’s law books were purchased by Oxford's Bodleian Library. During WWII the room was used as the headquarters of American Colonel Bob Sink, Commander in Chief of the 506 Parachute Infantry Regiment, part of the 101st Airborne. The Dutch Parlour was a gentlemen’s smoking room and its walls are covered in satirical paintings executed by Dutch prisoners of war in the 1660s. 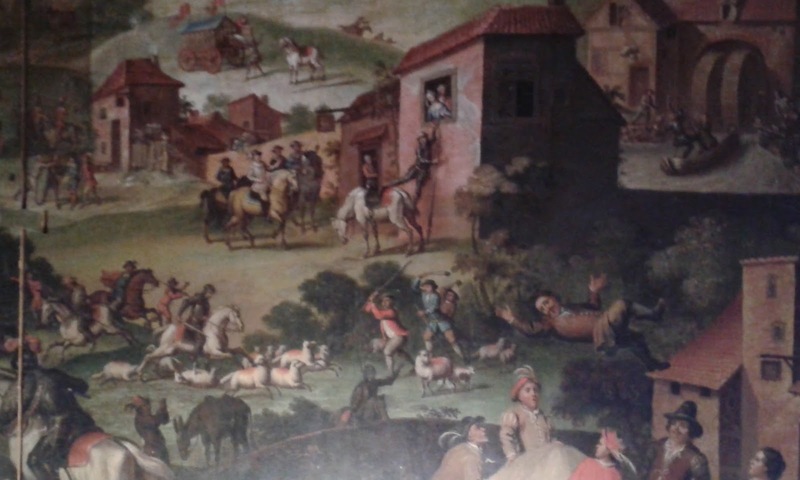 Most of one wall is occupied by scenes from Don Quixote. Small areas have been cleaned and restored, the rest much smoke-stained. We moved through the Brick Hall and Diamond Hall to the Chapel which would in its day have been the Great Hall of the Medieval manor. On completion of the Tudor Great Hall it was converted into a chapel. The pews were so high we found ourselves reaching for the floor with our feet and trying not to slide off. They were designed that way to keep the congregation awake and today we still use the expressions ‘keeping you on your toes’ and ‘dropping off’. Amazing the things you find out isn’t it. I had no idea! we made our way to the Long Gallery. 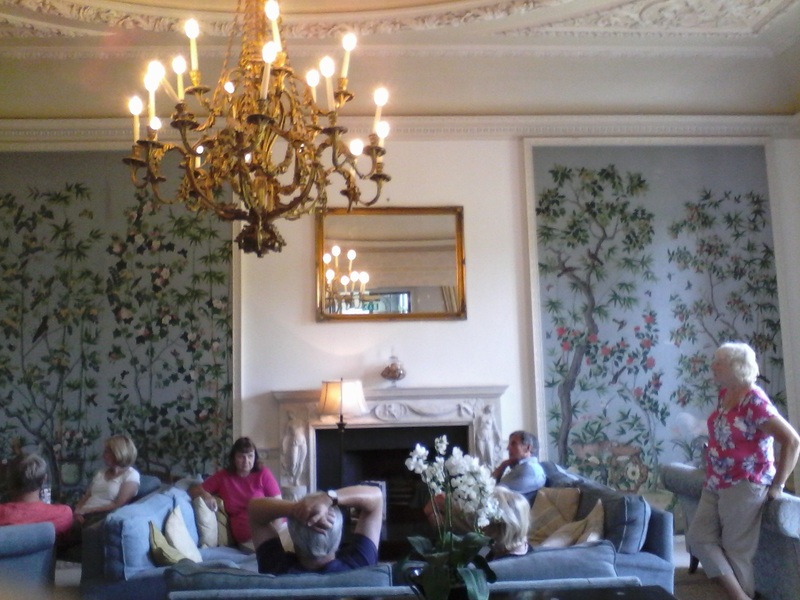 Though the original ceiling frieze remains the panelled walls are more modern. It was in this room that ladies would take their exercise without dirtying their hems or harming their complexions. From the oriel window they could watch the men hunting. The view today is far different from the one they would have seen when forest still covered the land. The River Kennet runs along the back of the land though it is inaccessible to today’s visitors. Entrepreneur Peter de Savary bought Littlecote House in 1986 and lived there for some years. Forced by bankruptcy to sell, it was acquired in 1996 by Warner Holidays who built the present hotel in 1997. The new buildings are sympathetically constructed. I can’t tell you how many bedrooms there are but the faux Tudor dining room holds four hundred people! Somehow the vast room seems very intimate and the floor to ceiling windows look out onto the beautiful gardens. I've left out as much as I've put in. If you want to see you'll have to visit yourselves. 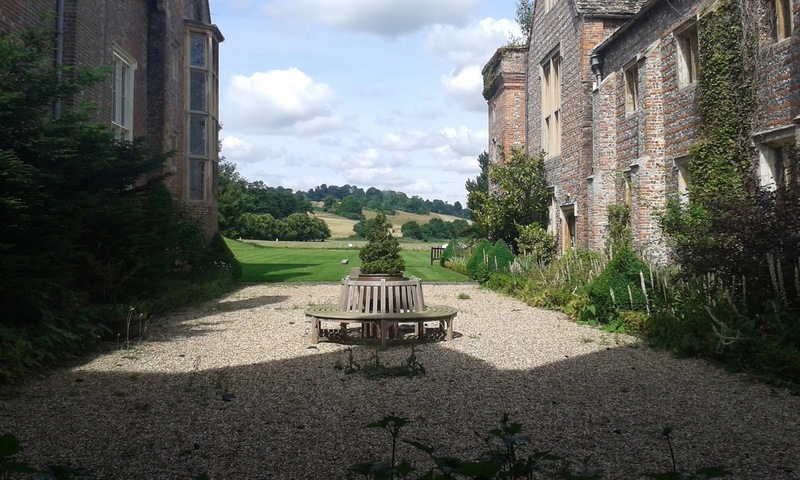 Littlecote House is set in beautiful grounds in a lovely part of the country and we were lucky enough to begin our stay the day summer arrived! Boy was it hot!!! What a lovely place! I hope you came home with lots of fiction ideas? Warners was always the posher of holidays camps and back when my family spent our holidays with them they only had the one 'adult only' venue. Mum always threatened to leave us kids at home and holiday with grown ups. Looking back I have the feeling she wanted to leave Dad behind as well! Lots of ideas, Elaine. I kind of wished I wrote Tudor. Three ghosts and lots of skeletons in cupboards! It was fascinating. So much I could have included but then it would have been, well, a short book. The concept of adults only is an interesting one. They have, as you know, several other venues now. We plan to try a different one next time. 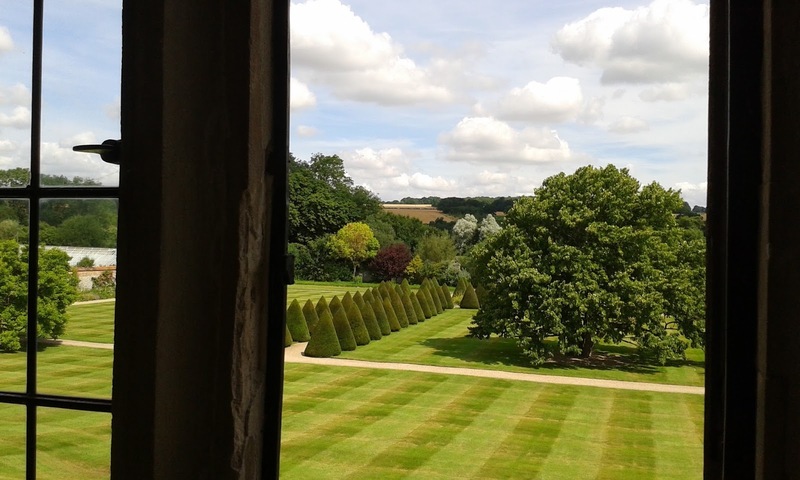 Lovely blog, thank you, Natalie, and Littlecote is the setting for my next timeslip! It is such a fascinating place, isn't it. So many centuries of history! Thank you, Nicola. It took me ages to do because I was in such a dilemma as to what to put in and what to leave out. In the end it was a bit like putting a pin in. Yes, a wonderful place. Looks a wonderful place to visit, Natalie. It is, Carol. 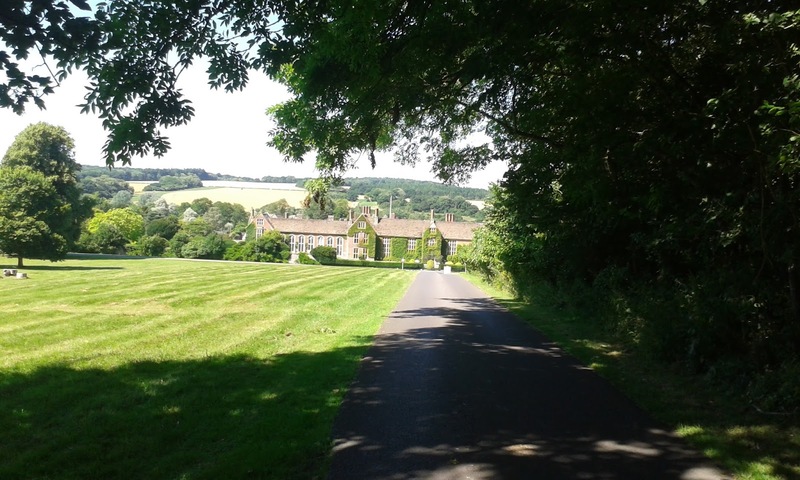 Both the house, the grounds and the surrounding countryside. There are some real gems if you turn off the main roads.